A journey by one woman to decode male movies. What did you watch this weekend? Well, I spent my weekend getting acquainted with the all-American hero John McClane from the well-known Die Hard movie franchise. It may be hard to believe but before this weekend I had never seen a single film in this series! I know shocking right? But, as I had to explain to about five boys, who asked me, “Don’t you watch good movies?” Yes, I do watch good movies but I am a girl and we have extremely different tastes. So there I sat, watching this action packed macho thriller in a room full of boys, and I have to say, I got pretty into it. We started with the first film and I was introduced to Bruce Willis’s character, John McClane. 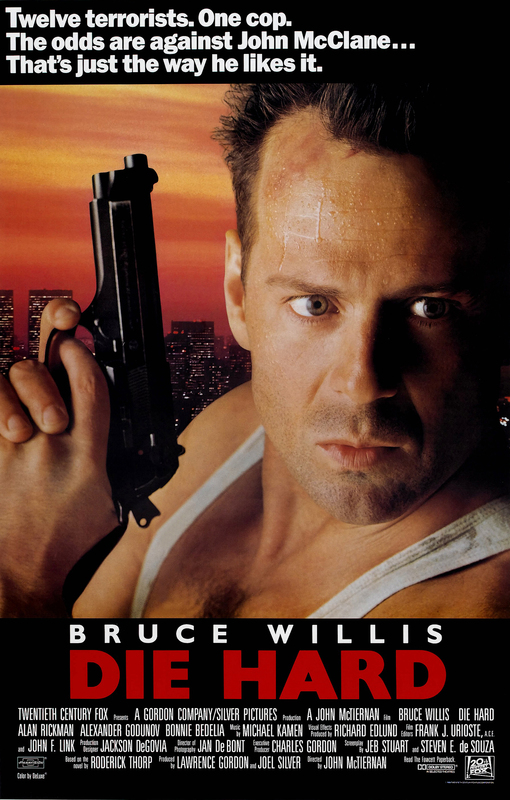 McClane is a New York cop, who is in Los Angeles to see his estranged wife Holly. McClane ends up at Holly’s Christmas Eve work party on the 30th floor of this huge skyscraper. Along comes this big bad group led by none other than Severus Snape. Yes, you read that right. Alan Rickman, who played Snape in the Harry Potter films, played the antagonist Hans Gruber in Die Hard (There was much laughing by the boys when I made this discovery). While Holly is being held captive with her co-workers by this group of terrorists, McClane is using everything within his power to fight against these bad men, shoeless no less! I really came to appreciate this character and found it endearing when he would have little conversations with himself, I guess you need to be a little bit crazy to do any of the things he does in the film. Die Hard: With a Vengeance, number three in the series was the next film to be crossed off my list. All the boys said the second film wasn’t as good so we skipped it. What I loved about this film was the awesome pairing of Bruce Willis with Samuel L. Jackson. They made a truly dynamic duo whilst roaming around New York City, with clues left by ‘Simon’, who was actually the brother of Hans Gruber, the mad man McClane killed off in the first film. There were a lot of twists and turns in this one and I enjoyed trying to figure out the clues before the characters did. Overall, I have to say that I found these (at least these two) Die Hard films to be a captivating and exciting. Many times I was on the edge of my seat in anticipation of what would happen next. I’m looking forward to seeing the other films in the series. Love the Die Hard series. I’m not sure if it was the 3rd or 4th one, (I’m inclined to believe it was the 4th) where he literally pile drives a car into a helicopter. Made of win? I think so. Can I Haz Discourse Plz?